Pursue your fixed income investing goals on your terms—Schwab can help you do it. 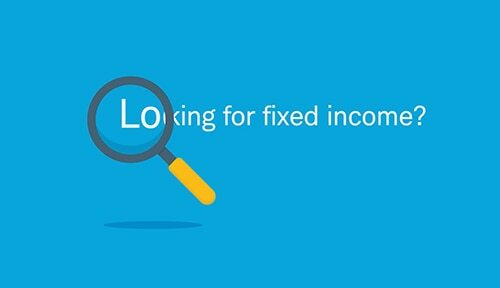 Looking for help solving your fixed income challenges? Count on Schwab, where we can access thousands of individual bonds from hundreds of dealers across the marketplace; for straightforward pricing so you keep more of your money; for access to over a thousand new issues every year; plus hundreds of no-load funds and commission-free bond ETFs. Schwab Fixed Income Specialists can help meet your goal with unbiased guidance. Leveraging their advice and experience to review and recommend a fixed income strategy customized to one important investor: You. Schwab's secondary market average security count and Fixed Income specialists data are as of January 2016. Unique number of dealers is as of December 2015. All orders placed through a Schwab representative are subject to an additional $25 fee and all orders to sell bonds must be placed through a representative. Schwab reserves the right to act as principal on any bond transaction. In secondary market principal transactions the price will be subject to our standard mark up in the case of purchases and a mark down in the case of sales and also may include a profit to Schwab in the form of a bid-ask spread. When trading as principal, Schwab may also be holding the security in its own account prior to selling it to you and, therefore, may make (or lose) money depending on whether the price of the security has risen or fallen while Schwab has held it. Schwab will not act as both principal and agent simultaneously in the same transaction. Schwab's short-term redemption fee of $49.95 will be charged on redemption of funds purchased through Schwab's Mutual Fund OneSource® service (and certain other funds with no transaction fee) and held for 90 days or less. Schwab reserves the right to exempt certain funds from this fee, including Schwab Funds®, which may charge a separate redemption fee, and funds that accommodate short-term trading. Charles Schwab & Co., Inc., member SIPC, receives remuneration from fund companies participating in Schwab's Mutual Fund OneSource® service for record keeping, shareholder services and other administrative services. Schwab also may receive remuneration from transaction fee fund companies for certain administrative services. Trades in no-load mutual funds available through Mutual Fund OneSource (including SchwabFunds) as well as certain other funds, are available without transaction fees when placed through schwab.com or our automated phone channels. For each of these trade orders placed through a broker, a $25 service charge applies. Schwab reserves the right to change the funds we make available without transaction fees and to reinstate fees on any funds. Funds are also subject to management fees and expenses. Trades in ETFs available through Schwab ETF OneSource™ (including Schwab ETFs™) are available without commissions when placed online in a Schwab account. Service charges apply for trade orders placed through a broker ($25) or by automated phone ($5). An exchange processing fee applies to sell transactions. Certain types of Schwab ETF OneSource transactions are not eligible for the commission waiver, such as short sells and buys to cover (not including Schwab ETFs). Schwab reserves the right to change the ETFs we make available without commissions. All ETFs are subject to management fees and expenses. Please see Charles Schwab Pricing Guide for additional information. Charles Schwab & Co., Inc. receives remuneration from third-party ETF companies participating in Schwab ETF OneSource™ program for record keeping, shareholder services and other administrative services, including program development and maintenance. Take advantage of our expertise to help you make confident investment decisions. At Schwab, we provide the help you need to invest in fixed income, whether you prefer to invest on your own or would like professional assistance. Tools & resources for self-directed investors. Our platform can help you screen through thousands of fixed income investments to select the product that is right for you. Timely market analysis through expert insights. With timely analysis focused on what matters for investors, Schwab's insightful perspective and practical advice can help you make better investment decisions. Dedicated specialists for complex needs. If you have complex needs and require guidance on fixed income strategies, you can get help from our dedicated team of fixed income specialists. Become more informed with insights and ideas. Stay at the forefront of modern investing with insights and ideas from Schwab experts, including Kathy A. Jones, Senior Vice President and Chief Fixed Income Strategist, Schwab Center for Financial Research. Rely on specialized, unbiased guidance for help. Whether you prefer to invest on your own or would like assistance, Schwab offers guidance to help you meet your goals. Choose one-on-one help, attend a local workshop, or access our search tools, research, and expert mutual fund and ETF picks to find the right fixed income investments and strategies for your portfolio. One-on-one help puts our dedicated team of over 100 Fixed Income Specialists, who draw on an average of over 21 years of experience in the financial services industry,1 to work for you. They take time to understand your needs, and since they’re not paid on commission, they offer unbiased guidance on your investment choices and strategies. At Schwab, you’ll know up front the transaction costs of buying and selling bonds. And unlike many brokers, we itemize bond costs, so you know exactly what you’re paying—trade confirmations clearly identify transaction fees and commissions. *Schwab reserves the right to act as principal on any fixed income transaction, public offering or securities transaction. When Schwab acts as principal, the bond price includes our transaction fee (outlined above) and may also include a markup that reflects the bid-ask spread and is not subject to a minimum or maximum. When trading as principal, Schwab may also be holding the security in its own account prior to selling it to you and, therefore, may make (or lose) money depending on whether the price of the security has risen or fallen while Schwab has held it. When Schwab acts as agent, a commission will be charged on the transaction. More investment choices to meet your needs. Schwab offers an extensive selection of fixed income investments, including bonds, bond funds and ETFs, CDs, and preferred stock. Manage your cash and cash investments with Schwab CD OneSource®. Access over 800 no-load, no-transaction-fee4 bond funds through Mutual Fund OneSource® and over 50 bond ETFs3 that trade commission-free online in Schwab ETF OneSource™. Generate regular quarterly income with new-issue and secondary market preferred stocks and securities. Rely on experts to professionally oversee your individual securities based on your investment style and retirement strategy. Why invest in fixed income investments? Whether your goal is to diversify your investments, save for the future, receive dependable income, or minimize taxes, fixed income investments may have a place in your portfolio. Adding investment-grade bonds to a stock portfolio can help lower the portfolio's volatility over time. Research shows that since 1976, negative annual returns have been uncommon in a broadly diversified bond portfolio. Fixed income securities are typically designed to provide a regular stream of interest payments. See how bonds pay income. Many bonds have preferential tax treatment under which coupon payments are tax-free at either the federal or state level, or both. So it’s important to know how tax treatment varies by bond type. Easily find and manage your fixed income investments. Identify the right fixed income investments for you using Schwab BondSource®, which lets you screen more than 60,000 bonds from more than 200 dealers.2 Schwab also simplifies managing your portfolio by providing you access to an extensive number of resources. Avoid the 3 most common errors investors make. You can expect a response by phone within approximately 48 hours. If you’d like to speak with a Schwab Fixed Income Specialist immediately, please call us at 877-906-4670. We appreciate the opportunity to work with you to meet your goals. How much do you have available to invest? Investors should consider carefully information contained in the prospectus, including investment objectives, risks, charges, and expenses. You can request a prospectus by calling 800-435-4000. Please read the prospectus carefully before investing. Past performance does not guarantee future performance. Investment returns and principal value will fluctuate, and shares, when redeemed, may be worth more or less than their original cost. We respect your privacy. By submitting the information above, you consent to Schwab using the information you provide to communicate with you and to provide information about products and services. Read more about online privacy at Schwab. 1. As of December 2017. 2. Conditions Apply: Trades in ETFs available through Schwab ETF OneSource™ (including Schwab ETFs™) are available without commissions when placed online in a Schwab account. Service charges apply for trade orders placed through a broker ($25) or by automated phone ($5). An exchange-processing fee applies to sell transactions. Certain types of Schwab ETF OneSource transactions are not eligible for the commission waiver, such as short sells and buys to cover (not including Schwab ETFs). Schwab reserves the right to change the ETFs we make available without commissions. All ETFs are subject to management fees and expenses. Please see Charles Schwab Pricing Guide for additional information. 3. Availability on Schwab BondSource as of December 2017. 4. As of February 2016. Fixed income securities are subject to increased loss of principal during periods of rising interest rates. Fixed income investments are subject to various other risks including changes in credit quality, market valuations, liquidity, prepayments, early redemption, corporate events, tax ramifications, and other factors. Restrictions apply: Online trades of Schwab ETFs are commission-free at Charles Schwab & Co., Inc. (Member SIPC), while trades of certain third-party ETFs are subject to commissions. Broker-assisted and automated phone trades are subject to service charges. Waivers may apply. See the Charles Schwab Pricing Guide for details. All ETFs are subject to management fees and expenses. An exchange process fee applies to sell transactions. Certificates of deposit available through Schwab CD OneSource typically offer a fixed rate of return, although some offer variable rates. They are FDIC-insured and offered through Charles Schwab & Co., Inc. In the bond market, there is no centralized exchange or quotation service for most fixed income securities. Prices in the secondary market generally reflect activity by market participants or dealers linked to various trading systems. Bonds available through Schwab may be available through other dealers at superior or inferior prices compared to those available at Schwab. All prices are subject to change without prior notice. Schwab reserves the right to act as principal on any fixed income transaction, public offering or securities transaction. When Schwab acts as principal, the bond price includes our transaction fee (outlined above) and may also include a markup that reflects the bid-ask spread and is not subject to a minimum or maximum. When trading as principal, Schwab may also be holding the security in its own account prior to selling it to you and, therefore, may make (or lose) money depending on whether the price of the security has risen or fallen while Schwab has held it. When Schwab acts as agent, a commission will be charged on the transaction.